prAna sent me this beautiful jacket for review on my blog. 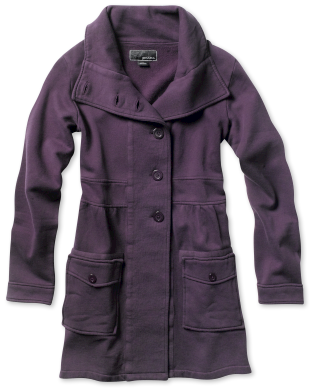 It is called the Sylvie jacket and comes in five awesome colors. The jacket retails for $88. It has "Deep flap pockets hold everything you need; the textured cotton fleece, tall collar and double-button front cut the chill." I really love the jacket. It is a little loose on me but looks pretty nice like that. It is very soft and warm which is perfect for fall. I will be wearing this jacket everywhere! The company also sells many different men's and women's clothing. It took me a long time to decide what to review because everything was so cute. This is a great company! Great choice. This is one beauty of a jacket.